Filters have become some of the more familiar tools in the studio these days, due in large part to their ubiquitous use in dance music. Even if you aren’t especially fond of resonant sweeps and acid basslines however, there are still many good reasons to stockpile a handful of filter plug-ins. 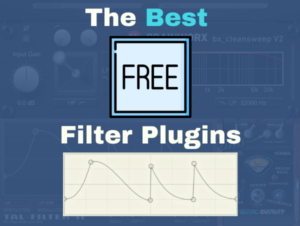 So in this article we’ll take a look at some of the best free filter VST and AU plugins you can use to get your feet wet. Filters are actually similar to equalizers, in that they cut or boost certain frequencies of sound. The now-familiar swooshing “wow-wow” sound heard on thousands of dance tracks is typically the result of cranking the resonance and sweeping the cutoff frequency, either by hand, via ADSR envelope control, LFOs, or automation. There are more utilitarian applications for filters as well. Steep high-cut filters can tighten up the low-end of a mix by eliminating sub-bass frequencies that eat up headroom and cause bottom-end flab. Low-cut filters for their part can reduce harshness in the high-end. Many producers agree that analog filters produce the warmest, most vibrant, and most satisfying sounds. But filter plug-ins have come a long way since the advent of the earliest software effects. Some of them can even replicate analog circuitry to an astoundingly accurate degree. 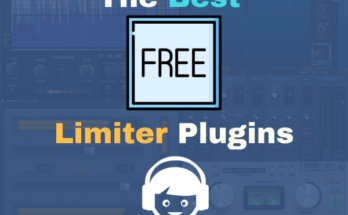 As you will see from these free filter plug-ins, you can get those wonderful swirling and wooshy sounds right on your computer. Best of all, you can do so without having to cough up the cash for an expensive analog device. Stillwell Audio’s Oligarc Filter is a midi-controllable plug-in emulation of the ladder filter design found in classic Moog analog synthesizers. 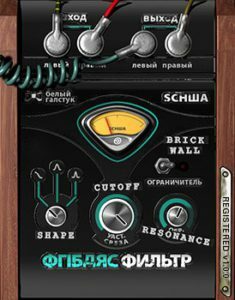 The same filter utilized in the company’s own Olga virtual analog synthesizer and Oligarc effects suite, the standalone Oligarc Filter has pretty much all the tonal and response qualities of vintage designs. 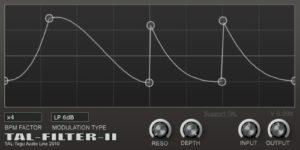 Like classic analog filters, the Oligarc Filter is non-linear in its response and performance, which lends a bit of desirable instability and loads of character. And like the filter employed in the Minimoog, it gives off more than just a hint of unpredictability and danger in its sound. In deference to those with more fragile sensibilities, the Oligarc Filter comes with a soft-clipping limiter that helps keep things from getting too out of control. Nevertheless, this is one filter for which the word “restraint” doesn’t apply. This is apparent by its readiness to go into self-oscillation with no apparent resonance limit. TAL’s Filter 2 is a much less rambunctious filter, although it’s perfectly capable of tiptoeing dangerously close to the edge of aural assault. It syncs quite nicely with your host DAW’s tempo, enabling you to produce rhythmic filter effects and wobbling modulations that would be right at home in your next dubstep track. Those that have used TAL’s excellent NoiseMaker virtual analog synthesizer plug-in will recognize the wide array of filters in the Filter 2. From multiple flavors of low-pass and high-pass to band-pass and notch, they’re all here in all their 4x oversampled glory. Like all respectable filter plug-ins, the Filter 2 can be pushed into saturation, in this case, by cranking the input control. You can also modulate the panning or volume level of an incoming signal, so this filter can do triple-duty as a tremolo or gate effects device. Tekit Audio 8kut 2 is an eight-band frequency cutter plug-in that isn’t quite like your typical filter plug-in. Intended specifically for DJs and live performers, it probably isn’t the first plug-in that most would think of when looking for a studio mix tool. Nevertheless, its ability to cut frequencies via eight pads could make for some interesting sonic experiments. 8kut 2 provides control over the bass, mids, high mid, and treble ranges. Although it is a fairly simple plug-in, the assortment of presets that it comes with gives you a good idea of the vast range of sounds possible. 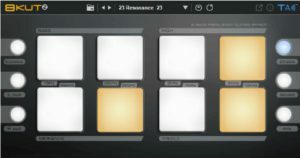 The biggest strength of 8kut 2 is its ability to cut frequency bands via the eight pads, all of which can be mapped to a MIDI controller. Even though you might prefer a more “traditional” filter plug-in for most other tasks, the 8kut 2 could be very useful as an idea generator. Now in its second version, Brainworx’s bx_cleansweep is a duo of high and low-pass filters that are better suited to subtle tone shaping than dancefloor-friendly filter freak-outs. Designed to filter out excessive low- and high-end, it draws inspiration from the onboard filters found in classic studio mixing consoles. You could say that the bx_cleansweep is the odd one out in this roundup, which is mainly populated by more resonant and sweep-y filter plug-ins. Nevertheless, its ability to tighten up the bottom end and eliminate top-end brittleness makes it a useful addition to any plug-in collection. Furthermore, Brainworx’s Anti-Crush technology gives it a very musically pleasing sound that will find a welcome place in your productions. For the familiar filter sweeps and resonant effects that have become indelible parts of the dance music lexicon, the Oligarc Filter is the one to beat. Thick, chunky, and satisfying, it still isn’t quite a Moog filter…but it does come close. The TAL Filter 2 is no slouch either. With the ability to modulate the filter cutoff, the volume, and the pan, it definitely has a bit of an advantage in the rhythmic department. As for the 8kut 2, you could very well use this as an idea generator, even if you have no plans of playing out. And if you need a quick and simple mix-assist tool that sounds great and is easy to use, you could do a lot worse than the bx_cleansweep.